This is the first in a five-part series on metrics every fundraiser needs for both short-term and long-term success. We call them Vital Signs or Metrics that Matter. Unlike what Roger Craver at The Agitator calls ‘vanity metrics’ (number of hits, number of visits, number of ‘likes’) a vital sign metric –a metric that matters—is one that triggers the “What-should-I-do-differently-to-improve?” question. In our personal lives we monitor our health indicators like weight, pulse, blood pressure, cholesterol and blood sugar levels. We can do no less as fundraisers, except the major indicators of our organization’s fundraising health are different. Fortunately, easy-to-use and inexpensive technology now gives us all the ability to track these key Vital Signs across all measurable channels—direct mail, telemarketing and social media. What’s even more fortunate is that this vital growth and success information is already on our donor databases. No need for complicated or expensive data overlays or reports. We just have to focus in an organized way on what already exists and put it to work. Each of these metrics can and should be used to improve and grow your program to achieve maximum value and income. 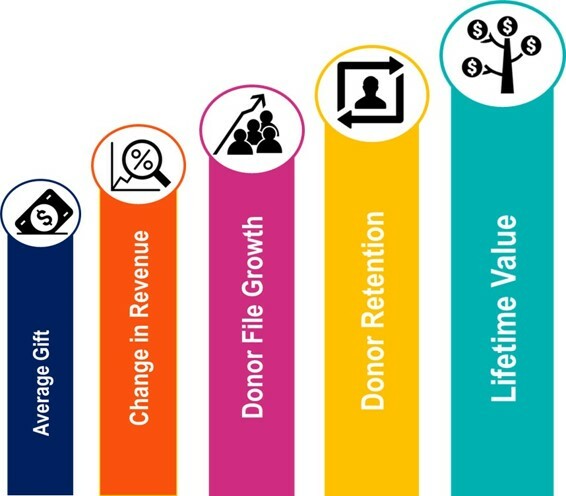 The first four metrics help you guide your program in ways that contribute to an increase in the most important success metric—Donor Lifetime Value. Lifetime Value (LTV) is the most important and fundamental fundraising metric. It’s sometimes called “the GPS of fundraising” because it enables us to quickly determine whether the overall value of a single donor or our entire donor base is increasing or diminishing in value over time. Simply stated, Lifetime Value is the gross revenue you can expect from your donors over a period of, for example, 5 years. This metric is essential to establish the level of investment you make for the acquisition of new donors and the development and growth of donors on your health file. 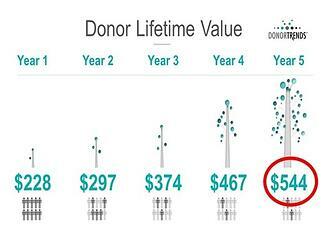 See Ben’s post on Investment clearly indicating how an investment of $30 to acquire a new donor turns into $136 in Lifetime Value in just 5 years. If you find yourself needing to persuade your CFO, Board or CEO on the need to invest money to acquire new donors or spend money upgrading, stewarding, and building value in your current donor base there’s no more persuasive metric than LTV. It clearly and specifically shows how much that investment you want to make to the long-term health of your organization. By using LTV as your guide you’ll avoid jumping into any new strategy or new initiatives until you can determine that these new approaches might be successful in lifting LTV. If they will, then go ahead and test it. There are many ways to calculate lifetime value. The important thing is you pick one, understand, and stick to it. Step 1: Calculate 5 year LTV [5 years of revenue / donors acquired]. If math isn't your thing, DonorLytics will calculate it for you - it's a free tool for all nonprofit fundraisers. You'll also be able to see the LTV of your organization compared to other organizations in you sector. You can quickly and easily get each of the metrics above — and more — for your own file by going to this special Sign Up Page to get started. Remember, what gets measured is usually what gets managed. So, start measuring with metrics that really matter to your organization’s future. In Part 2 of this series we’ll cover Vital Metric #2: Average Gift. PS: We’ve prepared a brief –and free-- guide to accompany this five-part series. You can download 5 Vital Metrics to Monitor and Improve the Health of Your Fundraising Program. PPS: What metrics are you tracking? I want to expand the conversation beyond the 'top 5'. Thanks for your input!